Recently inducted into The Rock And Roll Hall Of Fame in New York, Roy Wood is known throughout the world as a founder of The Move, ELO and Wizzard. On Tuesday 19 December you can hear all his hits, including ‘I Can Hear The Grass Grow’, ‘Flowers In The Rain’, ‘Blackberry Way’, ‘See My Baby Jive’ and of course, the Christmas chart topper ‘I Wish It Could Be Christmas Everyday’. In 1966, Roy Wood, along with Carl Wayne, Bev Bevan, Ace Kefford, and Trevor Burton, formed The Move, who were to become one of the most legendary, and indeed, notorious bands of the Sixties. After securing a residency at London’s Marquee Club, The Move’s first single ‘Night of Fear’ immediately landed the band in the Top 5, which set a precedent for nine further Top 20 hits over the next five years, all written by Roy. ‘Fire Brigade’ was followed by the chart topping ‘Blackberry Way’ before personnel changes within the band led to Roy teaming up with Jeff Lynne. Whilst The Move continued to record four more hit singles and two albums, the Electric Light Orchestra was born to accommodate Roy’s burning desire to create pop songs with heavily classical overtones. Wood then left ELO to form a new group, Wizzard, which included two drummers, two sax players and two cellists! Roy has written more than thirty UK top 30 chart singles, and is one of the very few people to have written and performed on number one hits with three different acts; The Move, Wizzard and Jive Bunny. He has won many awards, including the Ivor Novello Award for Most Outstanding Song Collection, Kerrang’s Songwriter Award, Rock Radio's Classic Songwriter and Mojo’s Classic Songwriter Award. His most regularly broadcast song is the Wizzard single ‘I Wish It Could Be Christmas Everyday’, which re-enters the charts each year on download sales, as it is no longer physically available as a single. What better way to party during the festive season than with the legendary Roy Wood! 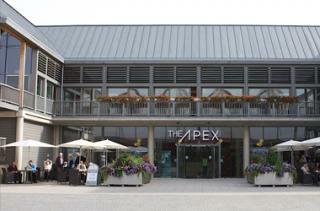 Roy’s gig at The Apex on Tuesday 19 December starts at 8pm. Tickets are £27.50 standing and £29.50 seated. Ring the box office on 01284 758000 or see the website - www.theapex.co.uk for details.